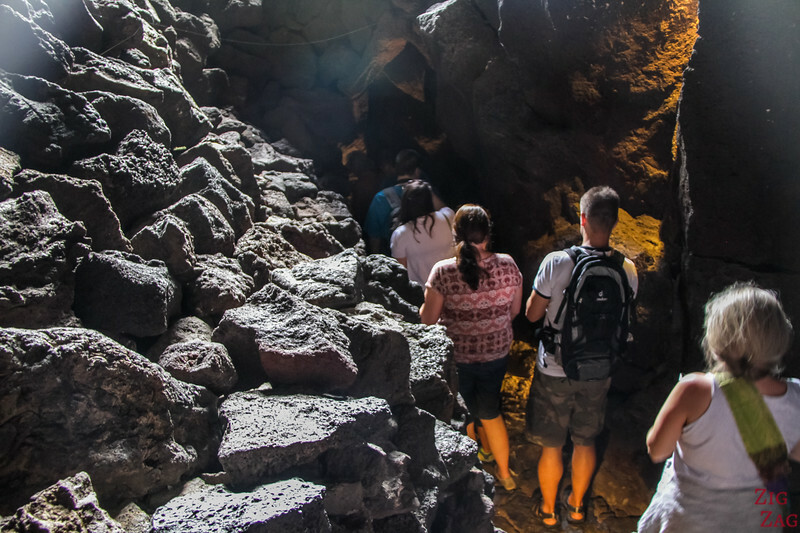 The Green caves Lanzarote are one of the most fascinating attractions on the island: exploring the work of Nature by walking 2 km in a lava tube that formed 3 to 4000 years ago! 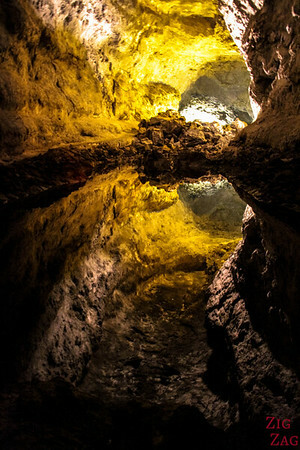 This is one of the 2 Lanzarote caves opened to visitors. 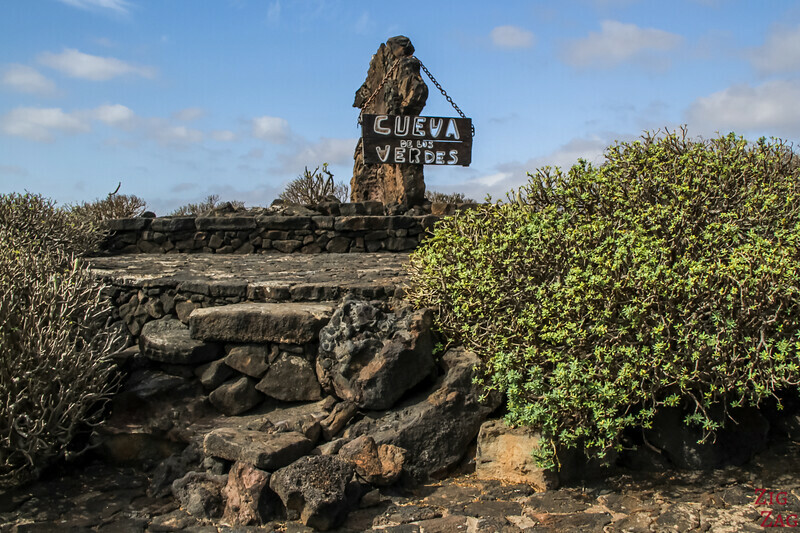 Below is my guide to help you plan your visit to Cueva de Los Verdes with many photos! What are the Green Caves Lanzarote ? 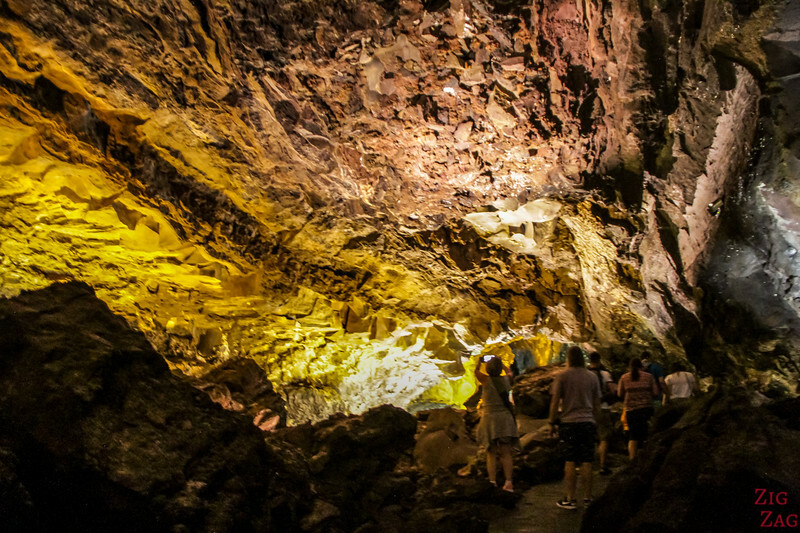 The Green Caves in Lanzarote are one of the top attractions on the island. 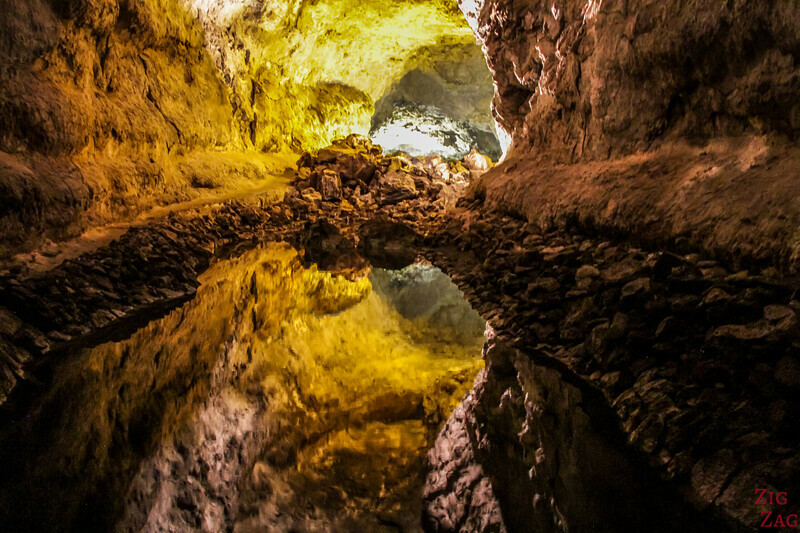 Their local name is Cueva de los Verdes. 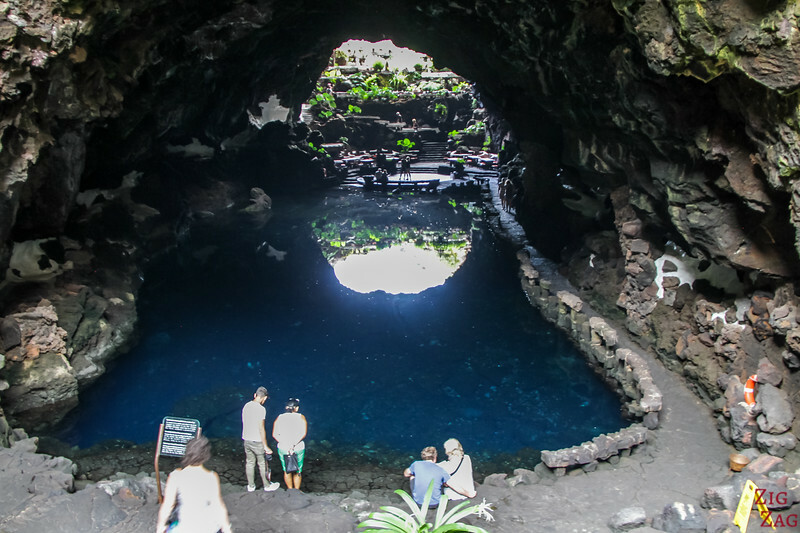 It consists in an accessible section of the famous long lava tube in the North of the Island . 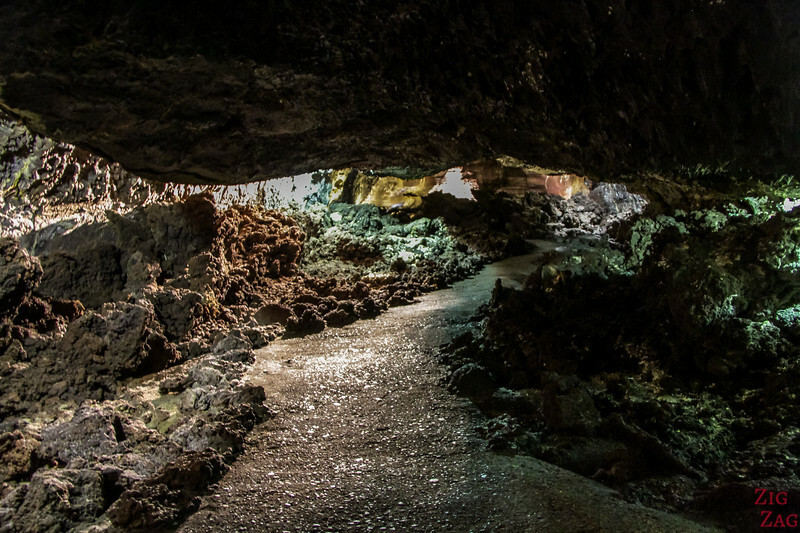 It is already cool to be able to explore a lava tube but on top of that, artist Jesus Soto has set up lights along the path to intensify the experience. 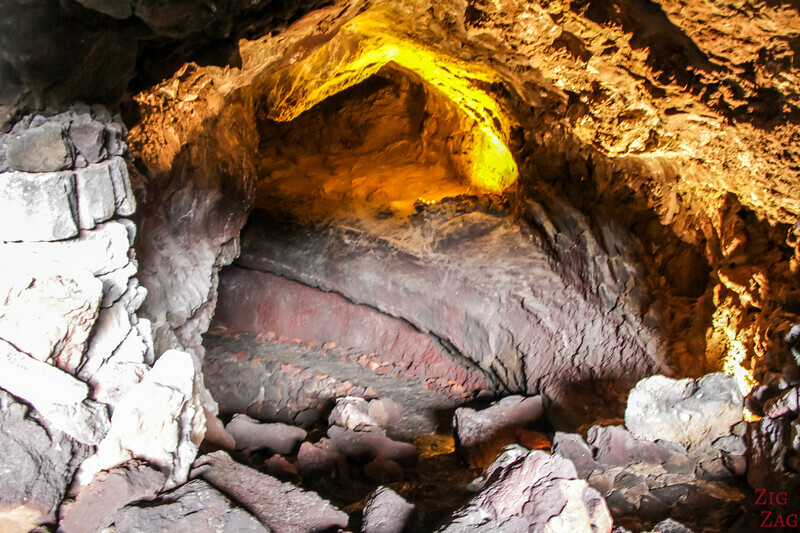 The lava tube formed following the eruption of the volcano La Corona 3 to 4000 years ago. The top of the lava stream cooled down and solidified into a crust and the inside was still flowing. Later the stream drained leaving only the crust. The tube is 6km long inland and continues below the sea for 1.5km. It is one fo the longest tubes going under the sea so it is often referred to as the Atlantis tunnel. In 20 locations the roof has collapsed allowing access to the lava tube. Those caverns are called Jameo. 2 portions of the the tube can be visited. 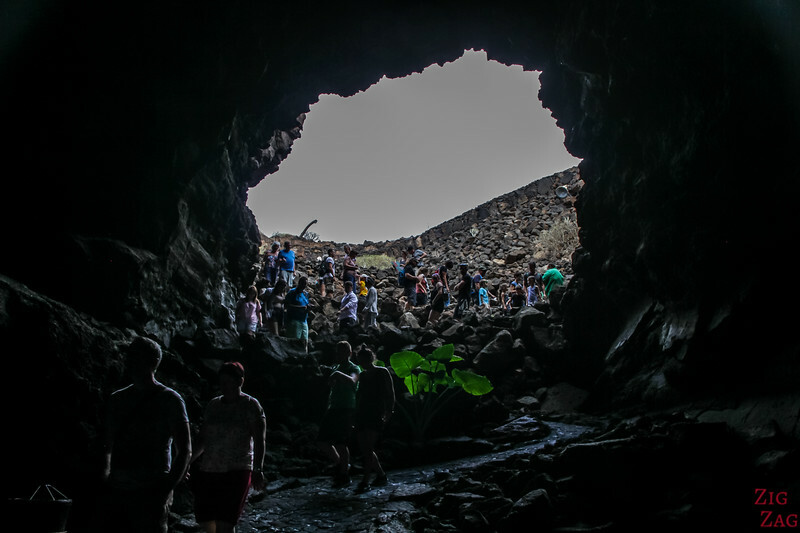 They are often referred to as the "Lanzarote caves": Jameos del Agua where César Manrique has imagined architectural elements to complement nature (see my article) and the more natural and less accessible Green caves we are visiting in this article. Contrary to Jameos del Agua, the Green caves only have one Jameo. This is where we enter and and come back. The whole tour is underground. 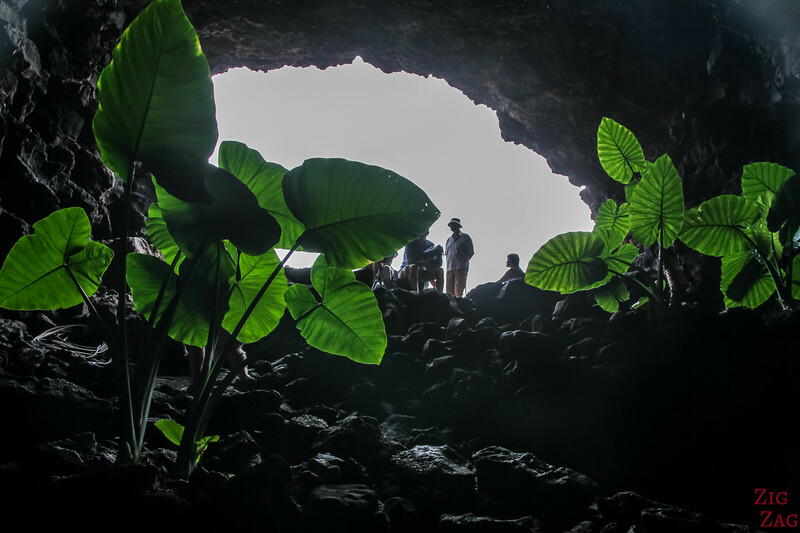 It allows you to explore 2km of the lava tube. In the 1960s, Jesus Soto was commissioned to set up simple lighting in the tube so that archeologists and scientists could work safely. But he took the liberty to play a bit more with it. Apparently it as originally also a music show where the light turned off, but it was deemed unsafe. So today we just enjoy the lights and the capacity to navigate in this fascinating environment. 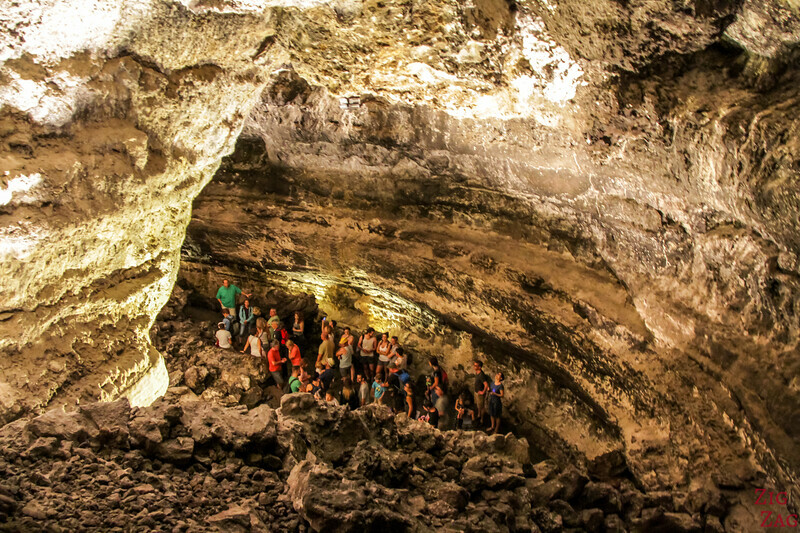 According to the guide, it was name after the Green family who used the caves to shelter their animals. 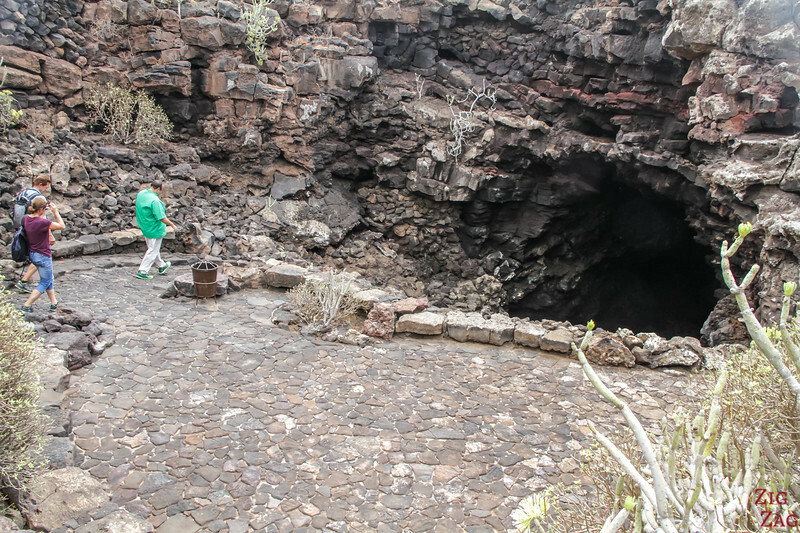 Before I take you a on a photo tour of Cueva de Los Verdes, I am sharing information to help you plan your visit to Lanzarote's green caves. 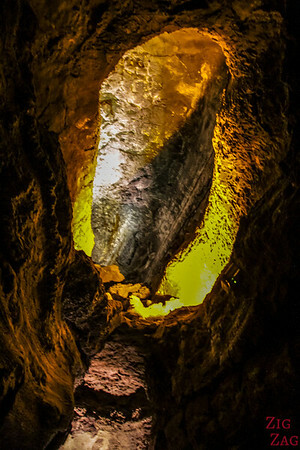 The Lanzarote caves are located in the North of the island, on the East coast. There is good road signs. No way to miss them. It is included in the CACT (tourism centres) so you can use the 3, 4 or 6 centres combined tickets. There are quite a lot of steps to go down and back up. 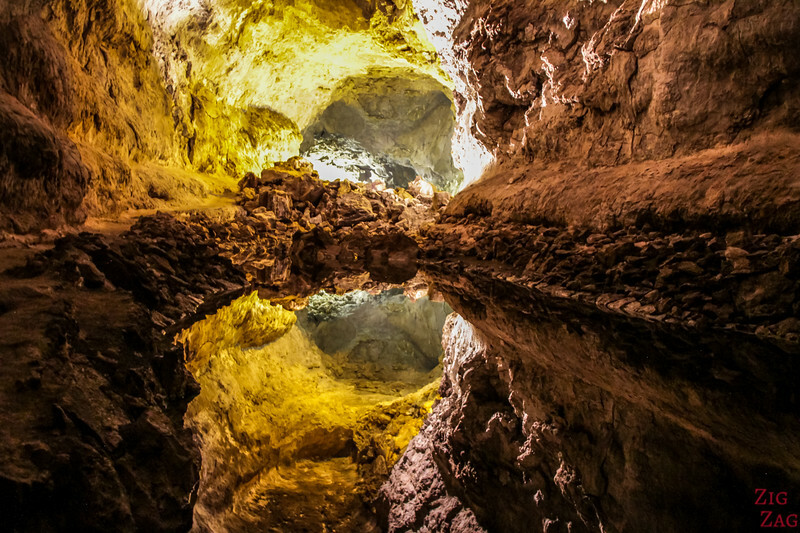 Is Cueva de los Verdes worth a visit? 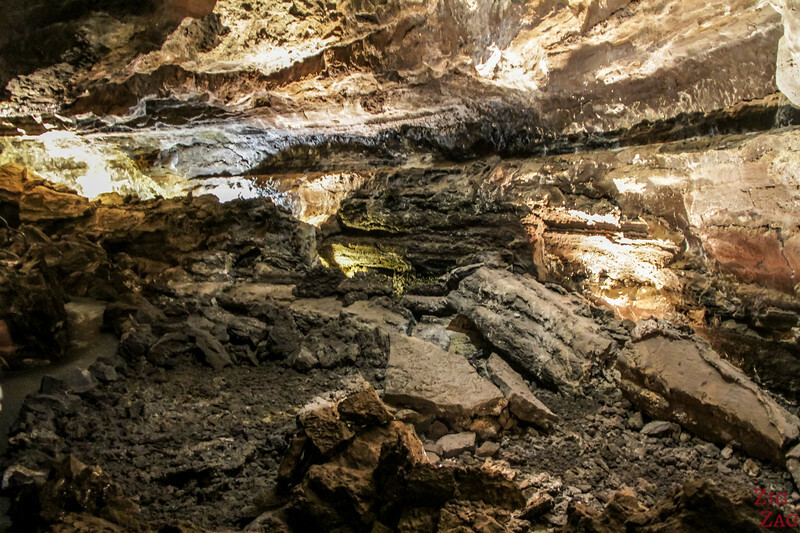 Well, if you have never been inside a lava tube, it is definitively worth a visit. 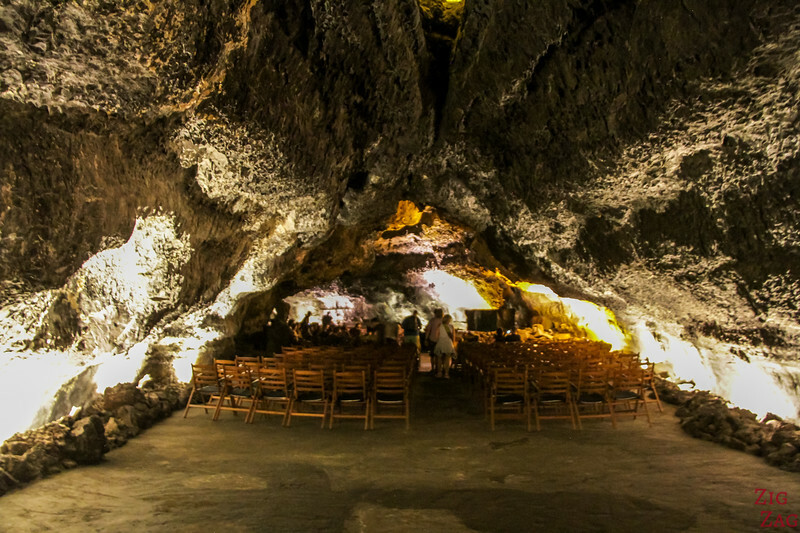 The experience is completely different from Jameos del Agua as there are no human set up except of the light and you are fully underground, so no external light come in. This is more about the nature and the power of the Earth creating the tunnel. 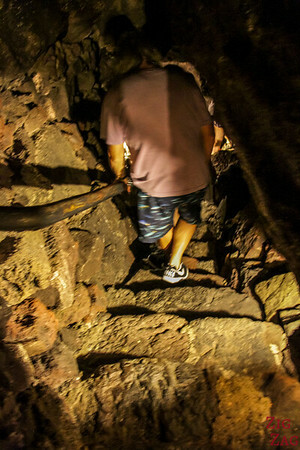 Contrary to Jameos del Agua, tours of the green caves are only guided. So you first have to wait by the entrance hole until you tour starts. But it is already fascinating to see the solidified lava and how it is shaped around the holes. And then you discover the inside of the lava tubes. 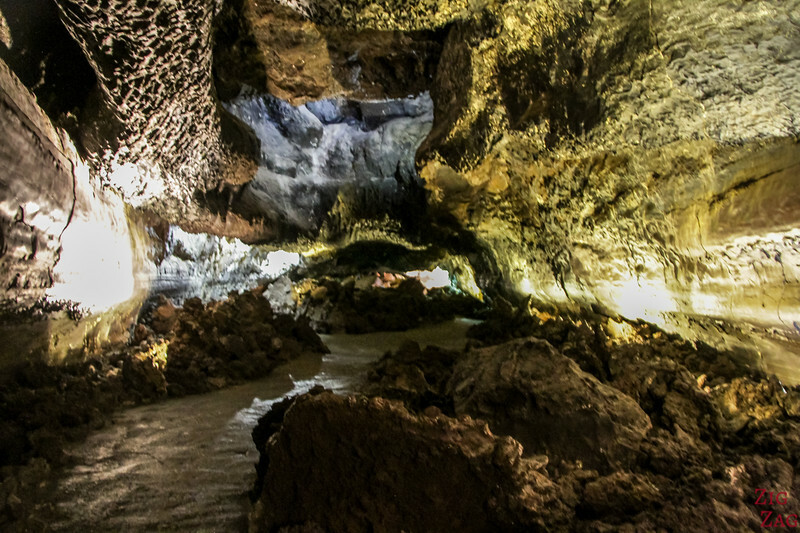 It is not like typical caves with salagmites and stalagtites. Take the time to admire the different layers of rocks and their different colours. You will walk through different chambers of different sizes. Some sections can be 50m tall and 15m wide while others are narrow and low. Jesus Soto has placed the light in interesting spots to highlight the shapes created by the cooling lava. The different section of the tube have interesting names such as The Crypt or the Monster's head. I must admit that I was so fascinated that I missed most of the guide's explanation because I was lagging behind. But I got to enjoy the space with only a few people around who were like me, taking in the power of Nature. Those tunnels were used in the 16th and 17th as a sanctuary. Local islanders used to hide in those tunnel so that pirates could not find them. Then you enter another smaller tunnel before discovering the theatre area, the natural auditorium where concerts are held where you can test the notable acoustics. After the auditorium, you clib up some stairs to reach another area of the tube. The most beautiful part to my opinion. 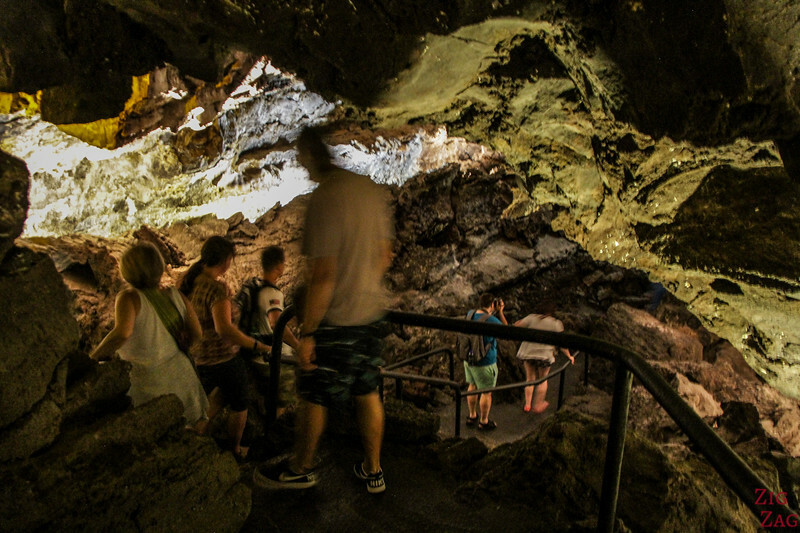 BUT STOP READING IF YOU DON'T WANT TO SPOIL THE SECRET you will discover during your tour of Cueva de los verdes! At the end of the tour, they make you stop and stand still and you approach what seems to be a huge drop with a lower tunnel under you. You start wondering why there are no fences since it looks so deep and people are pushing around to see. And then the tour guide drops a rock and you feel completely stupid. 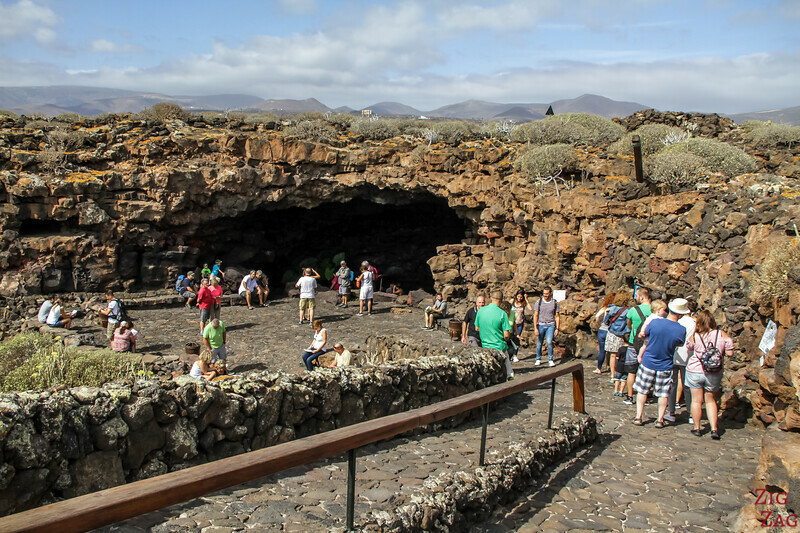 If you are looking for the other cave to visit in Lanzarote, it is called Jameos del Agua. It is another section of the tube between several collapses of the roof. The space has been transformed by César Manrique. This is where you will find the underground lake with the white crabs. 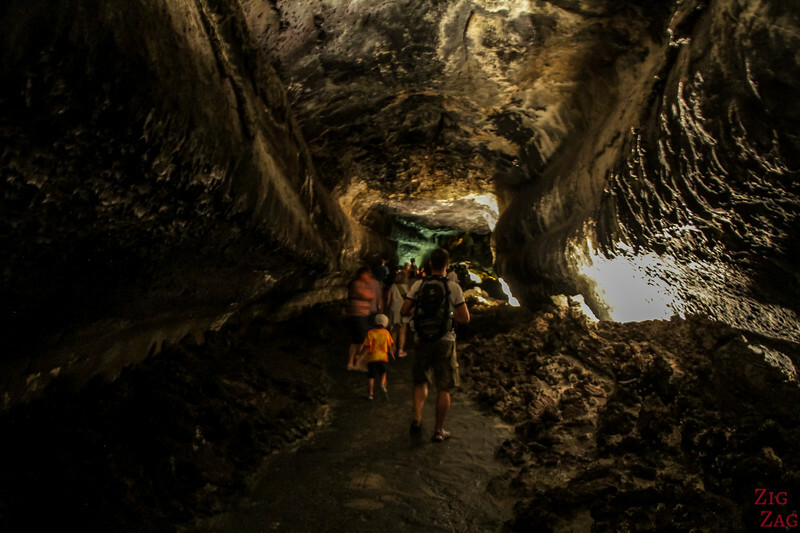 Would you visit a lava tube?